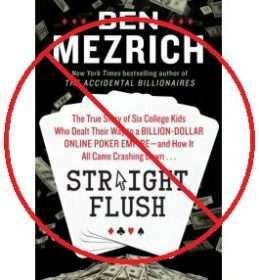 Among the core lies served up by Ben Mezrich in Straight Flush, which is easily the biggest literary fraud of this decade, is that the primary members of the University of Montana SAE fraternity group that founded Absolute Poker left the company soon after AP became embroiled in troubles. The troubles themselves are clear: First came the legal difficulties presented by the UIGEA’s passage in late 2006, and then 2007’s fallout from the site’s insider cheating scandal, said cheating being led by AP founder Scott Tom himself. The real explanation of why the cheating occurred stretches far beyond what a blog post like this could entail, but it was due primarily to the over-leveraging of the acquisition of the UltimateBet shortly after the UIGEA went into effect, followed by the frat boys’ adamant determination to continue on with their mad-spending, lifestyle. Nothing more than that, in the final evaluation: greed and self-indulgence know no bounds. But with decades of lifespan in front of them, and with tens of stolen millions at their disposal, it’s little wonder the AP frat boys would want to rewrite history. The garbage you’ll read in Straight Flush (should you be conned into purchasing it) is part of that effort. Absolute Poker acquired UltimateBet in a shady deal worked on by a phalanx of prominent gaming lawyers that was designed to do two things: (a) continue producing revenue for both the UltimateBet and Absolute Poker shareholder groups; and (b) disguise the fact that both companies were still primarily US-owned. The key to that, as the gaming laws explained was to “get the biggest Indian you can find.” I have that on tape, actually, in a statement made by later AP CEO Ron Janusz as he attempted to explain to cheated AP shareholders in teleconference calls why the shell constructs created by the lawyers were a great concept. I should know — I was patched into one of them. The “biggest Indian” turned out to be Joseph Tokwiro Norton, former grand chief of the Kahnawake tribe and an instrumental player in the creation of the Kahnawake Gaming Commission, the same entity that claimed to regulate AP. The sales, first of UB to AP, and then of both companies to Norton’s Tokwiro Enterprises, proved to be as fraudulent as everything else. The first press releases claimed Norton made a $10 million cash payment as part of the purchase; a year later, that was revised to $5 million to better comply with an ongoing court case, and when the truth finally came out in documents related to the United States’ “Black Friday” case, it turned out Norton made no payment at all: he was merely sent a monthly stipend in exchange for being the “operator” of Absolute Poker, with no mention of “ownership” by Norton actually existing in later years’ press releases issued by the company. It’s in this environment of a faked corporate sale that Ben Mezrich, in Straight Flush, tries to peddle the tale of Scott Tom and Oscar Hilt Tatum IV flying off into the metaphorical sunset, leaving the company in the hands of the remaining frat boys, including Pete Barovich, Garin Gustafson and Brent Beckley. It didn’t happen that way at all. Instead, following the creation of the Tokwiro Enterprises fronting entity, the shareholders of Absolute Poker were split into two groups. The vast majority, more than 200 general shareholders not involved in the operation of the company, were shunted off to an ownership entity called Madeira Fjord, while the key frat-boy employees — AP execs and primary owners all — had their shares buried in a different entity called Avoine-Servico de Consultadoria e Marketing. At least seven of the frat boys had their shares hidden there, in exchange for a slice of the gross revenues plus the irrevocable right to assume control of the company from Madeira Fjord at any future date. That date came soon enough, when Madeira Fjord was quickly forced into bankruptcy proceedings in Norway, where the entity was domiciled. Meanwhile, the actual assets of Absolute Poker itself came under United States seizure order in conjunction with the Black Friday court proceedings. Lo and behold, out of the woordwork came lawyers on behalf of Avoine, the frat boys’ secret ownership home, claiming that they were the real owners. Of course, the lawyers refused to disclose exactly who the shareholders of Avoine were, and the contents of an Avoine shareholder registry remain one of the most closely guarded of all Absolute Poker secrets to this very day. But who was really in charge? If you believe Mezrich’s nonsense in Straight Flush, Scott Tom and Hilt Tatum were long gone. Due to the layered way in which the company accrued its original shareholder investments, those two became the company’s most powerful players, among all the frat boys. Mezrich’s claims that both Tom and Tatum left the company in late 2007 are garbage. Mezrich offers zero evidence, except for his own conversations with the two that they didn’t own the company any more. But real evidence? None. On the other side, plenty of evidence exists. In the recently released Travis Makar recordings, which were secretly taped in 2008 by UB cheater Russ Hamilton as he tried to secure his own future, UB CEO Greg Pierson and UB legal counsel Daniel Friedberg can be heard talking about the UB/AP deal in several passages, and reiterate throughout that despite the involvement of Norton and the appearance of the new ownership shells, Tom and Tatum were still in charge of AP. The largest of several tapes secretly made by Hamilton, nearly three hours in length and including huge swaths of revealing information about both UB and AP, can be found at YouTube here. Then there’s the story of Hilt Tatum’s wedding, moved from Florida to Paris in haste in late 2006 since none of the frat boys dared to return to the US. The St. Petersburg Times, in which the socialite affair of the Tatum-Bennett wedding occupied a year’s worth of lifestyle columns, found itself needing to run a news exposé on Absolute Poker after Black Friday, when hard evidence about AP’s real ownership was dumped in its lap by the jilted Madeira Fjord owners, who were robbed of promissory notes and continuing income worth at least $250 million. Meanwhile, most of Absolute Poker’s shareholders were out of the loop and increasingly angry after dividends dried up in 2009. Though a few early investors bought in at 10 cents a share, late-comers paid as much as $3. Total payout amounted to only 18 cents a share. What about the windfall? It never came. Shareholders heard that the founders were living luxuriously in Costa Rica and Panama, adding to their aggravation. [Richard] Borgner and Janusz told the shareholders that the founders left the poker operation years ago. Few disgruntled shareholders believed it. Shawn Mesaros, a Seattle investor, said another shareholder raised questions about the company’s finances in late 2009 and immediately got two calls — one from Tom, the second from Tatum, who suggested a meeting. “What would they care if they were no longer involved?” Mesaros asked. I’ve spoken at length in recent years with both Mesaros and the other shareholder, who was part of a Seattle firefighters investment group who seemingly became financial prey in the talons of the greedy Phil Tom. The calls from Scott Tom and Hilt Tatum indeed took place, and I received much additional information as well. As one would expect, once the company was collapsed and its shell games exposed, the greedy Avoine-housed frat boys still dared to try and wrest control of the few remaining assets, namely the software and the player database. When did that effort finally end? Last week, when the US government finally received a decree with prejudice that bars all existing and future Avoine claims against the assets of AP. For all the noise made by Tom, Tatum, Brent Beck, Pete Barovich and the others through the pages of the fraudulent Straight Flush, the SAE boys were still in there trying to grab for themselves, right to the very last. The jilted AP players, who are still owed at least $55 million left unrefunded when the site went under, are unlikely to get any money in any event, since the actual value of these assets is small. Nonetheless, any chance of even a few pennies on the dollar being returned rests with those assets being liquidated by the US government, the same entity the SAE frat boys continued to battle all the way until last week. The lies in Straight Flush? They run nonstop, start to finish. It’s an abomination of a book. Shame on Ben Mezrich. Shame on William Morris Books for publishing it. And shame on the frat boys themselves, though they moved beyond shame for their actions years ago.